The California Solar Initiative is ending. What has it left behind? Nearly all the money has been spent, and the California Solar Initiative is winding down. The direct CSI subsidy for installing photovoltaic (PV) panels on your house, which started at $2.50 per watt (of installed peak capacity) is now just $0.20 per watt. As of last week, the program has spent about $1.68 billion on rebates for 111,271 completed solar PV installations of about 1.2 GW in rated solar PV capacity. That works out to an average rebate of $1.40 per watt of capacity. The CSI covers from the smallest residential system of 1 or 2 kW capacity up to 1000 kW (1 megawatt), which can fit on the roof of a big box store. Utility-scale solar generation facilities, up to 500 MW capacity, are not part of the CSI. The vast majority of the CSI installations, about 93%, are residential and small commercial systems, 10kW or less in size. But the majority of capacity, about 63%, is in the 7% of systems that are over 10kW. The CSI has posted detailed data on the program that allows a closer analysis of what solar PV systems cost from 2007, when the program started, up to this year. The figure below shows that costs have come down for all systems, regardless of size, but the gap between the cost per watt of large systems and small ones has widened. Data on very large scale solar projects for the utilities (20MW-500MW) are not public, but reports suggest that they have come down the most and now have completed costs around $2/watt. The persistent cost gap is a reflection of where the cost reductions have come from over the last 6 years: solar panel prices, which have declined from about $4/watt in 2007 to less than $1/watt today when purchased in large quantities. The companies who install small systems tend to buy in smaller quantities and pay somewhat more for the panels. The big gap between small and large systems is in installation costs, which haven’t changed much for residential PV. Installation costs are most of what’s known as “balance of system”, the difference between the total cost and the cost of the panels. Unfortunately, installation of PV systems seems to suffer from Baumol’s cost disease, the idea that the relative cost of labor-intensive goods and services will rise over time unless there are significant improvements in labor productivity. Without a major efficiency breakthrough on installation, the cost of small PV systems (less than 10kW) has increased substantially relative to utility-scale solar (which has vastly cheaper installation costs), with the ratio rising from less than 2-to-1 in 2007 ($10/$6) to about 3-to-1 today ($6/$2). Luckily for the residential solar PV industry, increased federal subsidies for small-scale solar, new financing models, and an extremely solar-friendly residential rate structure have arrived in time to keep the industry going as the CSI has declined. A decade ago, the federal 30% tax credit for installing solar was capped at $2000 per household. Around 2007, that cap was removed, so the 30% credit now applies to the entire PV system cost, raising the subsidy for a typical 4kW residential system from $2,000 to about $7,200. At about the same time, the residential solar industry began offering customers an option to buy the power from the panels on their roof instead of buying the panels. The company owns the panels and sells you the power at a predetermined rate. This gives the company an incentive to keep the system working well and gives the customer some certainty about what the power will cost. But these power purchase agreements also lock the customer in for 10-20 years. Whether they turn out to be a good deal for the customer will depend on how fast utility rates rise compared to the price escalators that are built into the agreements. Among systems 10kW or smaller, the share installed under these power purchase arrangements increased from 12% in 2007 to 66% so far this year. The residential solar industry in California has also benefited from increasing-block rate structures: the rate increases for each incremental kilowatt-hour as the customer uses more electricity in a month. The lowest price tier in PG&E territory costs $0.13/kWh while the highest tier is $0.34/kWh. Most residential solar is replacing power that was being purchased on higher tiers, at prices that are much higher than the utility’s cost of providing that power. Thus, when customers install solar, the utility sees revenues fall by more than their costs, causing a drop in profits. In our regulated utility system, that means that rates must rise for everyone still buying power in order to make up the shortfall. If California’s investor-owned utilities charged flat rates, as the majority of U.S. utilities do, that price would be $0.16-$0.18 per kWh and the economics of residential PV would be much less attractive. So, as the CSI fades away, is residential solar PV on stable footing going forward? Probably not. The tax credits are under constant pressure in Washington. The very-steep increasing-block rates seem unlikely to continue, primarily because the tiers don’t reflect real cost differences of supplying power. The power purchase agreements don’t lower the basic costs of residential solar, though they do reduce the customer’s risk from poor PV system performance or a utility rate spike. 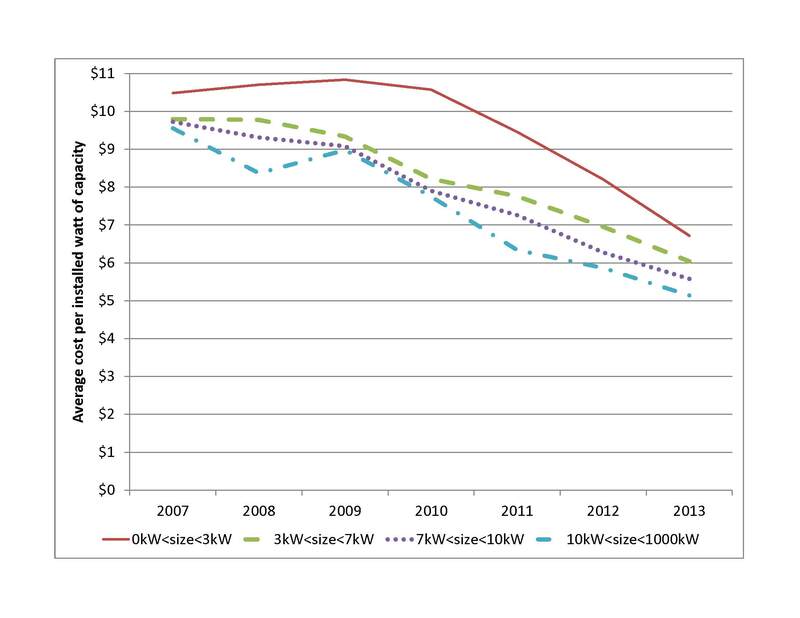 Fundamentally, the declining costs of PV panels is better news for utility-scale solar than for residential solar. And in the competition among renewables that means it’s likely to be bad news for residential solar. Did the CSI help to lower solar PV panel prices by growing the market? Unlikely. The entire capacity installed under the CSI is less than 2% of the worldwide PV panel installations since 2007. Are those CSI figures inflation adjusted? I’m really just surprised…@ $2/W cost, minus 30% ITC, CA utilities can have solar for a net $1.40/W. Assuming 5hr/day sun in CA (1,825hrs/yr), the simple per kwh cost of solar over 10/15/20 years is 7.7c/5.1c/3.8c (respectively). Seems like a very good deal with either the tiered or flat rate structures you describe. Also where are you getting your $6/W 2007 utility cost figure? Obviously, 1.2 GW of peak PV capacity is what’s left behind. In most cases, any after-market installation will be expensive, since you’ll be paying twice (roof in this case). In order to lower residential PV solar installation cost, it most be planned in at the design phase of the building. Once building codes, architect requirements, and grid regulations, includes PV solar as THE standard for any new house, the installation costs will come down drastically; maybe even surpass large scale PV solar installations because of the double duty of the roof (one example). The discussion about rates, above, misses the point completely, PV solar replaces, very expensive, peak power capacity. So just looking at rates is not relevant (there is a reason peak power rates are high). Because of residential PV solar, PG&E don’t have to spend capital for peak power capacity that sit idle most of the time. Here in Phoenix, APS completely misjudged (mostly because of the housing-bust) capacity needs, and now sits on unused capacity; guess who gets to pay for that. As a result APS blames residential PV solar for their over-capacity. The grid is another important issue (not discussed in the article). Does PG&E design the grid to take advantage of surplus residential PV solar, or do they just dump it into the ground because the grid is designed to deliver power one way only? What are the challenges? Current technology? what are the transmission losses?